We love butter, it's a slimming, healthy, superfood. Anyway, it's with great pride that we can announce the unique Green Pastures Butter Oil is now on our range. This is a supplement from the same family firm who also supply us with the Fermented Cod Liver Oil. Do carry on eating butter, and if your budget is tight, this is an excellent way to enjoy the benefits; please make sure it is organic if possible. And raw organic butter even better! 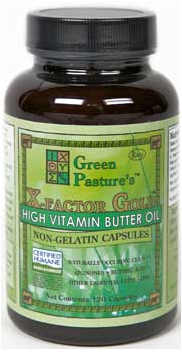 But if you can add the condensed nutrition of the Butter Oil supplement, you might be quite surprised at the benefits! *As a note to our vegan customers, please do ensure good amounts of Coconut Oil in your diet. Any questions? Then we would love to hear from you.